The Application button, represented by the App Studio icon , opens the Application menu of file-related commands. You can create a new document, open an existing document, save an active document, and print an active document. The Options button opens the App Studio Options dialog box, where you can set user preferences. The Application menu also lists recently opened documents. The Application button is always available. It is located in the upper-left corner of the App Studio interface. Tip: Double-click the Application button to exit App Studio. If you exit App Studio in this way, active (open) applications will not be saved. The Application button, which is represented by the App Studio icon, opens the Application menu, as shown in the following image. Open. Open an existing document. You can open a file from the list of configured WebFOCUS environments. Save. Save the active document. Save As. Save the active document with a new name. Run. Run the report, chart, HTML page, or document. When you click the Run menu, the Message Viewer Options submenu opens, as shown in the following image. When you select Message Viewer OFF and run a report, the App Studio Viewer window displays the report without any messages. When you select Message Viewer ON and run a report, the App Studio Viewer window displays the report and a message. When you select Display command lines, the App Studio Viewer window displays the report and the command lines. 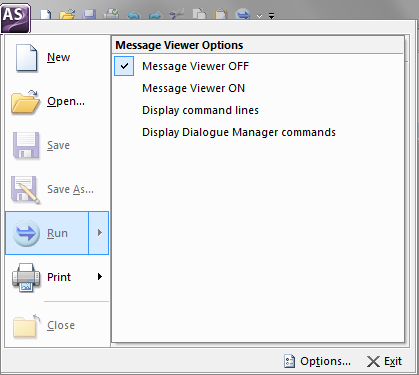 When you select Display Dialogue Manager commands, the App Studio Viewer window displays the report and the Dialogue Manager commands, and the result of their evaluation. Print. Print the active document. 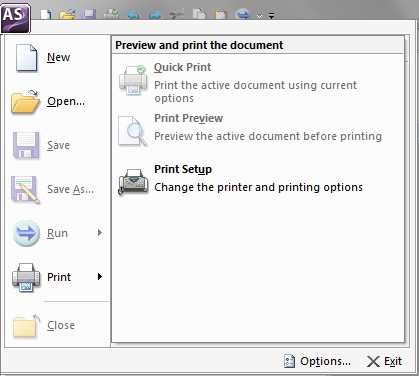 When you click the Print menu, the Preview and print the document submenu opens, as shown in the following image. From this submenu, you can print the active document using the current print options, preview the active document before printing, and configure your print options. Note: The Print and Quick Print options are only available when you edit content in the Text Editor, or when the Source view tab, in the Report canvas, is active. Close. Close the active document. Options. Open the Options dialog box where you can set user preferences. Exit. Close the active document and exit App Studio. In the Application menu, the terms document and active document represent all files which you can create in App Studio. Spaces are not allowed in file names. When naming a report, chart, HTML page, or document in their respective wizards or in the Save As dialog box, spaces are replaced with underscores. When naming a procedure, spaces and underscores are not permitted and when you press the Space bar, nothing happens. If the repository is set to display by title, the wizards, Open dialog box, and Save As dialog box will still expect a proper name, with no spaces, to be entered. The New dialog box opens when you click New from the Application menu. You select the type of file you want to create and then click OK. The New dialog box is shown in the following image. Procedure. Creates a .fex file, which defines how data is retrieved and displayed. Procedure via Text Editor. Creates a .fex file that you can customize using the text editor. HtmlPage. Creates a page in html format. You can import existing HTML content, as well. Document. Creates a document into which you can import reports, charts, and images. You can also create text boxes to import text and lines to draw boxes or lines. WebFOCUS Style Sheet. Creates a base template from which you can create a unique WebFOCUS Style Sheet. Closes the New dialog box. Closes the New dialog box and cancels file creation. Opens the App Studio Help. The Open File dialog box is shown in the following image. The Open File dialog box displays files that you can open and edit in App Studio. Contains a list of currently Configured Environments. You can navigate to different environments, development areas, and project folders to display different files in the file list. Displays all files of a specific type in a selected project folder. Note: Instead of the regular Master File icon, Master Files that have a DEFINE use the DEFINE icon and Master Files that have a Join use the JOIN icon. Use this text box to type the name of a file you want to open. Note: If you are in the Repository section and the tree is set to display by title, the Open File dialog box will only require a name to be entered. Filters to display all files of a specified file type. You filter for .fex, .htm, .js, .css, .mnt, and .txt files. You can also choose to display all files. Displays all files that are associated with the parent folder, when selected. Only one option, Show all Files in Associated Paths or Show Files in Selected Path Only, can be selected at a time. Displays only files in the current, selected folder. This option is selected by default. Only one option, Show all Files in Associated Paths or Show Files in Selected Path Only, can be selected at a time. When selected, the fully qualified path name of the file you select will be used. When selected, displays the Environment Tree. This option is only available when opening a file using commands and features in the Report canvas, HTML canvas, Document canvas, Join canvas, and the Procedure View panel. Toggles between displaying the files in the file list with details (date modified, size, etc) or in a list. Displaying files with details is the default. Note: If you choose to display details or not, App Studio remembers your choice and will keep the setting you chose the next time the Open File dialog box is open. For example, if you chose to display file details the first time you invoke the Open File dialog box, then the next time you invoke the Open File dialog box, file details are shown. Displays the name, date modified, size, and type of the file. The Save As dialog box opens when you click Save As from the Application menu. You can use this dialog box to save a file to another location or to provide a different file name. The Save As dialog box is shown in the following image. Note: If you are in the Repository section and the tree is set to display by title, the Save As dialog box will only require a name to be entered. You can customize App Studio by setting specific user preferences through the App Studio Options dialog box, as shown in the following image. General. Contains options for starting App Studio, minimizing the main window, and other settings. For more information, see General Tab. Reporting. Contains format options for output, field list displays, formatting a report for the web, and setting the record retrieval limits. For more information, see Reporting Tab. HTML Page. Enables you to set grid settings for an HTML page, preview reports and charts, set single or multiple layers, and alter the frequency in which you refresh thumbnails. For more information, see HTML Page Tab. Document. Enables you to set grid settings for a document, preview reports and charts, and alter the frequency in which you refresh thumbnails. For more information, see Document Tab. Environments. Enables you to change the viewable contents of the Configured Environments tree. For more information, see Environments Tab. Help Configuration. Enables you to configure the location of the web-based Help system for App Studio. For more information, see Help Configuration Tab. Output Viewer Settings. Enables you to set a specific browser to use for output or to use the App Studio Internal Viewer (default), and to set the navigation options for the output (run in new window, run in same window). For more information, see Output Viewer Settings Tab. The General tab contains the following options. Maximizes the application window when you begin each session. Sets new column types by using metadata and surrounding fields. Activates the Field tab on the ribbon upon selection of a field within the report canvas. Activates the Layout tab on the ribbon when no selection is made on the report canvas and you click the white space. Controls the appearance of the Welcome screen when App Studio is launched. Displays a prompt for users to confirm that they want to exit App Studio. Starts the local Reporting Server when App Studio is launched. Stops and closes the local Reporting Server when you exit App Studio. Allows you to set the number of recently used files that appear in the Recent file lists. The default value is 25. Sets the frequency at which requests are sent to the web or application server so your connection does not time out. The default is 5. Resets all message boxes to their default state. For example, if you selected the Don’t show this message again check box in any message box, clicking this button will reset all message boxes. Once you click this button, it becomes inactive until you choose not to display a message box in the product. Displays the short date format, mm/dd/yyyy hh:mm AM/PM, in the Open File dialog box, and the Environments Detail panel. This is the default format. You can clear this option to display the long date format, day, month, date, year hh:mm:ss AM/PM. Note: The Edit in Windows registered tool is only visible if the file type you are accessing has been associated with a Windows application. The file editor used determines which context menu options are available and controls the default behavior for double-clicking and right-clicking files. The Reporting tab contains the following options. The following options affect the appearance of the Fields tab of the Object Inspector. Displays any list of field names as qualified field names, which include data source and table names, alphabetically. Displays the full field name in the Fields tab, as specified in the file description. Displays the alternate field name in the Fields tab, as specified in the file description. Displays the titles for columns, filters, and computes in the Fields tab, as specified in the file description. Displays descriptive information about the field in the Fields tab, as specified in the file description. Displays the field length and format type in the Fields tab, as specified in the file description. The Authoring Mode options determine how field names in a procedure (.fex) are written in the WebFOCUS source code. These options are not affected by the selected Field List options. The following example shows source code in which the Category field name is assigned E02 in the ALIAS field of the ggsales.mas Master File. Specifies a limit on the number of records to retrieve from the data source. Setting a retrieval limit creates selection criteria for both Retrieval Limit and Read Limit dialog boxes. Specify a retrieval limit when you need only a few records to test the design of a new report, or you know how many records meet the test criteria and want to stop a search after those records are retrieved. This reduces total retrieval time. Specifies a limit on the number of readings that can be made against the data source. Specifies the default styling template when you open the Report feature. Specifies the default report settings when you open the Report canvas. Click Browse to select user-created templates. The Reporting tab of the App Studio Options dialog box allows you to set a report format to use as the default format by the Report feature. The following procedure describes how to set the default report format. In this example, User format is selected. From the Application menu, click Options. The User output is now the Default Report Option in the App Studio Report mode. The User format allows the application to select the actual output type at run time. For example, a developer could choose to view a report as Excel XLSX, PDF, active report, and more. The HTML Page tab contains the following options. Enables you to view a grid while you create an HTML page. The Show Grid check box is selected by default. Clear this check box if you do not want to develop with a grid. Enables you to snap to grid on demand. The Snap to Grid check box is selected by default. Clear this check box if you do not want to enable the snap to grid option. Customizes the width of your grid. The default is 10 pixels. Customizes the height of your grid. The default is 10 pixels. Specifies no layers in the HTML page. Specifies a single layer in the HTML page. This is the default setting. Specifies multiple layers in the HTML page. Opens the Form settings dialog box. The options for Form settings are described in Form Settings Dialog Box. Indicates that, when the Tab key is pressed, the number of spaces specified in the Tab size option is inserted. Indicates that, when the Tab key is pressed, a tab character is inserted. Specifies the number of spaces inserted when you press Tab. Sets the New Parameters dialog box to appear in the HTML page. This is the default setting. Sets the Default caching option to run in the HTML page. By default, this option is not selected. Sets the objects in the HTML page to arrange automatically. This is the default setting. Enables you to preview reports and charts before saving and deploying the HTML page. This is the default setting. Enables you to run the HTML page based on simulated data from WebFOCUS. Enables you to run reports and charts using live data in the HTML page. This is the default setting. Sets the record limit for reports. Values range from -1 to 999. The default setting is 500. Sets the record limit for input controls. Values range from -1 to 999. The default setting is 10. Sets a prefix to run before each report or chart component on an HTML page. Sets the time interval for refreshing thumbnails. Values range from 0 to 999 seconds. The default setting is 20. Sets the default theme for an HTML page from the Default Theme drop-down list. The Information Builders theme is the default theme. The following table describes the options available in the Form Settings dialog box. Sets the prompt orientation to appear to the left of the form settings. Sets the prompt orientation to appear above the form settings. This is the default setting. Sets the distance between prompt and input. The range is from 0 to 99 pixels. The default setting is 5 pixels. Sets the horizontal distance between controls. The range is from 0 to 99 pixels. The default setting is 4 pixels. Sets the vertical distance between controls. The range is from 0 to 99 pixels. The default setting is 10 pixels. Sets the horizontal distance between controls. The range is from 0 to 99 pixels. The default setting is 10 pixels. Adds a schedule to your HTML page. This is the default setting. Enables deferred running of a report. This is the default setting. Starts chains on a new line. This is the default setting. The Document tab contains the following options. Enables you to view a grid while you create a document. The Show Grid check box is selected by default. Clear this check box if you do not want to develop with a grid. Enables you to snap to a grid on demand. The Snap to Grid check box is selected by default. Clear this check box if you do not want to enable the snap to grid option. Enables you to preview reports and charts before saving and deploying the document. This is the default setting. Runs the document based on simulated data from WebFOCUS. Runs reports and graphs using live data in the document. This is the default setting. Sets a prefix to run before each report or chart component on a document. Note: The Environments options are used to control the development areas that are visible in the Configured Environments tree. At least one option must be selected and applied to all configured environments. The Environments tab contains the following options. Displays the Projects area in the Configured Environments tree. This is the default setting. Displays the Data Servers area in the Configured Environments tree. Displays the Repository area in the Configured Environments tree. Displays the Web Applications area in the Configured Environments tree. The Help Configuration tab provides the fields in which you can modify the App Studio Help configuration information to access the online Help system from your environment. Specify the protocol, either HTTP or HTTPS. Type the name of the machine where the Help resides. Type the port number of the web and/or application server. Type the context root for the location where the Help is hosted. The Output Viewer Settings tab enables you to set a specific browser to use for output or to use the App Studio Internal Viewer (default), and to set the navigation options for the output (run in new window, run in same window). Select a browser to use for output or select the App Studio Internal Viewer (default). The Browser Setup section is populated with a list of browsers that are installed on the App Studio machine. App Studio works with Mozilla Firefox®, Google Chrome™, and Microsoft Internet Explorer® browsers. The browser that is highlighted when you close the dialog box is the browser that will be used for execution. Sets the location of the browser executable. This field box is populated based on the browser selection. Sets the location of the web driver for the browser. This field box is populated based on the browser selection. Indicates the test URL for testing the browser setup. The default URL is http://www.ibi.com. Tests the browser setup, using the test URL. If the test is successful, the webpage will display in the browser and you will receive a success message. If the test is unsuccessful, you will receive a failed message. Saves the setup information for the selected browser. Sets the output to run in a new window. Sets the output to run in the same window.